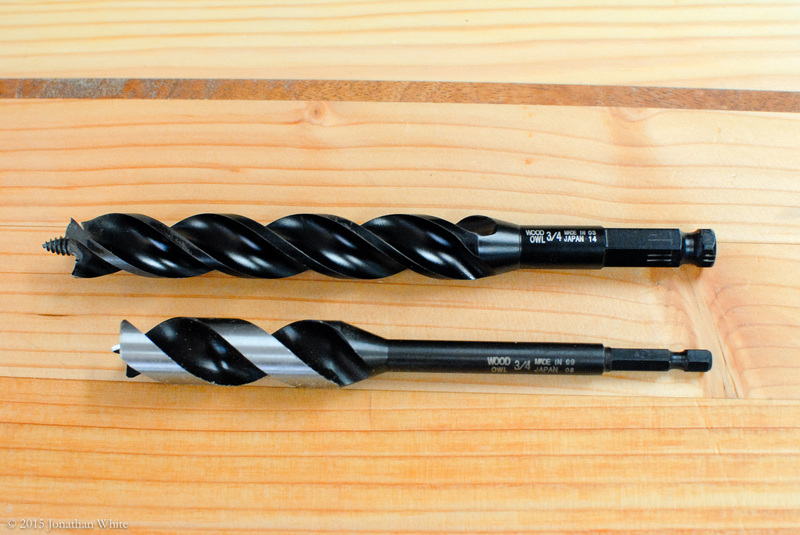 A couple of months ago, I was contacted by Star-M, the company that makes the WoodOwl line of drill bits. 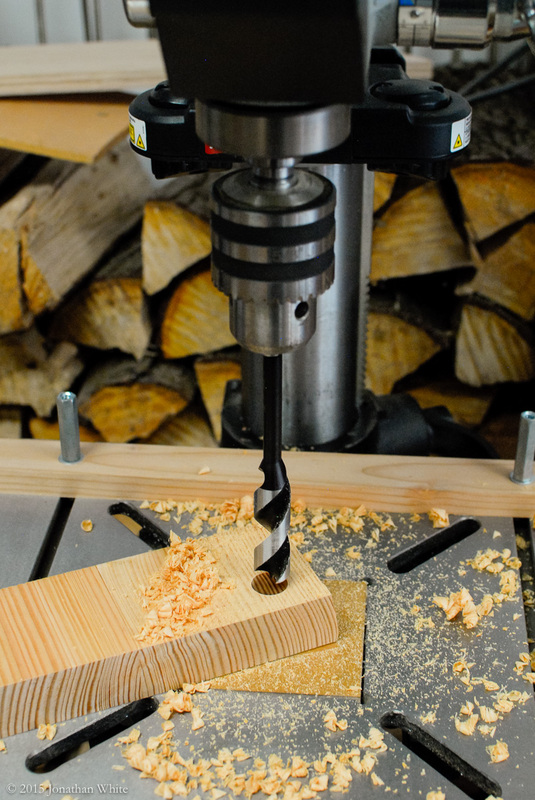 They had read some of my earlier posts in which I had used one of their Ultra Smooth Auger bits to drill all the dog holes in my benchtop and also all the holes in my sliding deadmen. They asked if I would be interested in doing a tool review of some of their OverDrive drill bits. This was quite a surprise! At one end of this spectrum, is someone like Christopher Schwarz, who will have absolutely nothing to do with manufacturer initiated tool reviews. He has a journalist background, which I think must account for much of this view, but more importantly, I think he recognizes how influential he is. The mere mention by him of a favorable opinion of a tool, sends their prices skyrocketing. I actually saw Millers Falls coping saws listed on eBay for $499.99. I am not now, nor will I ever be this influential. No one is likely to run out and buy something solely based upon on my opinion. Knowing how many companies would love to throw tools his way, I very much admire Chris Schwarz for his self imposed tool ethics. At the other end of the spectrum is…. Well, let’s not bandy anyone’s name about. You know who they are, and that’s enough. Let’s just say there are some woodworking blogs that seem to be begging for tools/money/donations with every chance they get. At least one is so far over the top, that I just don’t go there anymore. That’s a shame because there probably was some content worth viewing. Where do I fit in? Well, I don’t feel that I am at either end of the spectrum. Honesty and integrity are important to me, but I don’t feel the same need to have an absolute prohibition on tool reviews. I liked the idea of doing my first tool test/review and thought it would be a fun project and blog post. With one proviso, that I was free to give my own, unbiased opinion. I wrote back to Star-M, and told them about my ethical considerations. I said that so long as I was free to give my honest opinions, good or bad, I would be happy to do a tool review. They said that they had confidence in their tools and looked forward to my review. They sent me a set of bits to evaluate. 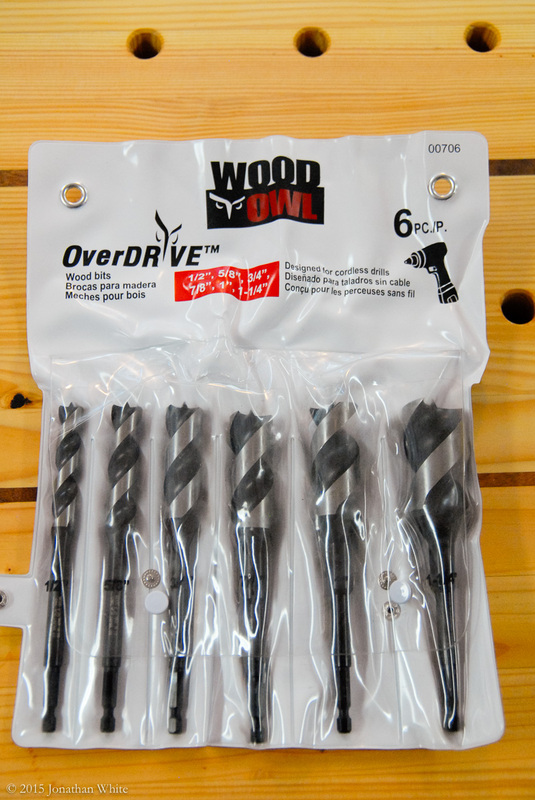 A 6 piece set of WoodOwl OverDrive drill bits. My first impression was that these bits are interesting. 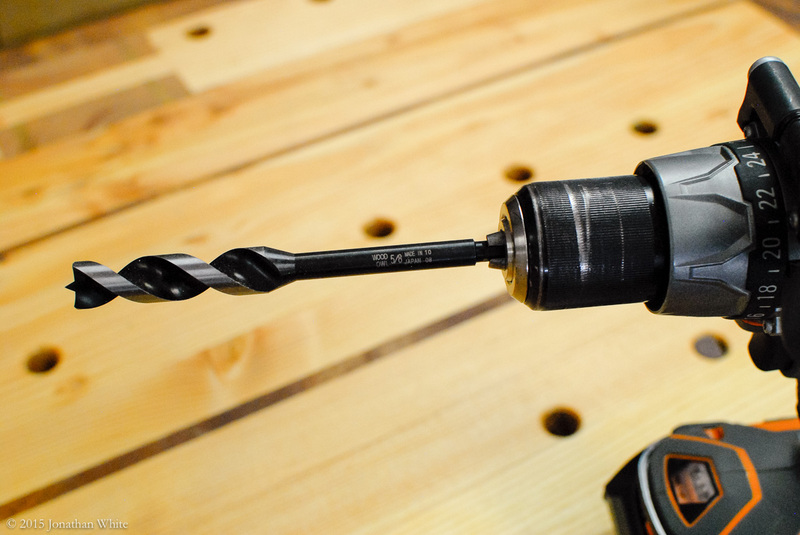 They don’t have a lead screw like auger bits; they’re not completely flat bottomed, like forstner bits; nor do they have as pronounced a lip as a brad point. I think most accurately, they would be considered a brad point auger, but what’s in a name? The six piece set contained sizes 1/2″, 5/8″, 3/4″, 7/8″, 1″, & 1 1/4″. These are not quite auger bits (no lead screw) and not quite forstner bits (they’re much longer). 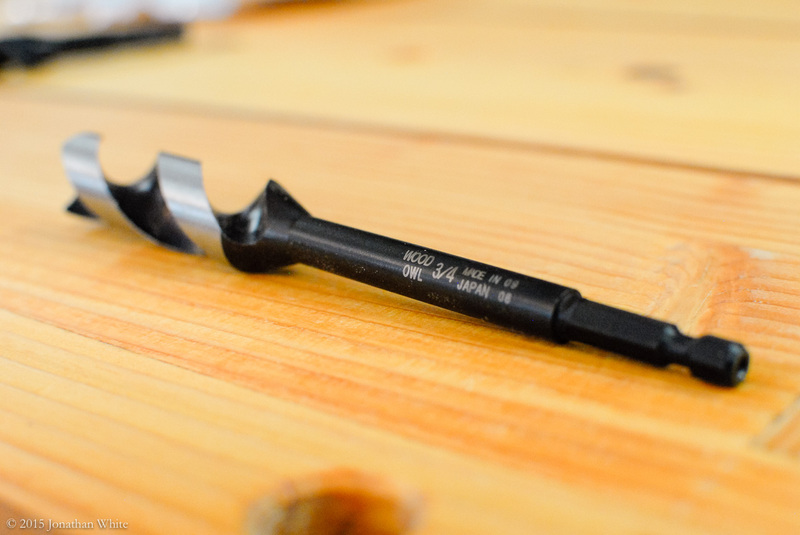 The OverDrive Bits have a standardized ¼” hex shank with ball detent. The OverDrive Bits have a spur point. These bits have an unusual cutting geometry. There’s no wings like many auger bits have. Here you can see a chamfer near the cutting edge. The side profile of the spur point. Another view of the chamfer at the cutting edge. The WoodOwl Ultra Smooth Auger Bits that I already owned. Comparing both the Ultra Smooth Auger (top) and the OverDrive Bit (bottom). To test or compare the bits, I thought I should try them out in both hard and soft woods. I also thought it would be interesting to compare them to other similar bits. My initial thoughts were that the OverDrive bits would be faster but that they would not bore as smooth a hole as the augers. Time to test that theory. 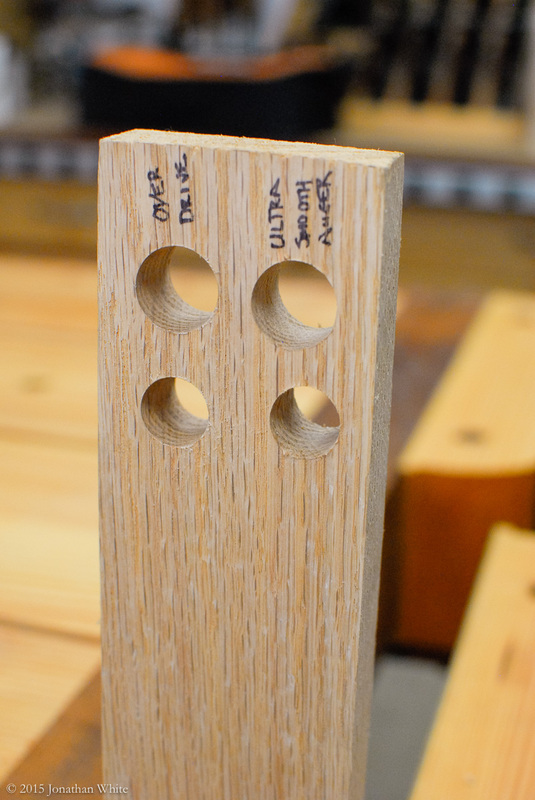 To get started, I drilled a ¾” hole in a piece of red oak with the Ultra Smooth Auger bit. Full disclaimer here, this bit has already been used to drill all the dogholes in my workbench, so it wasn’t brand new. 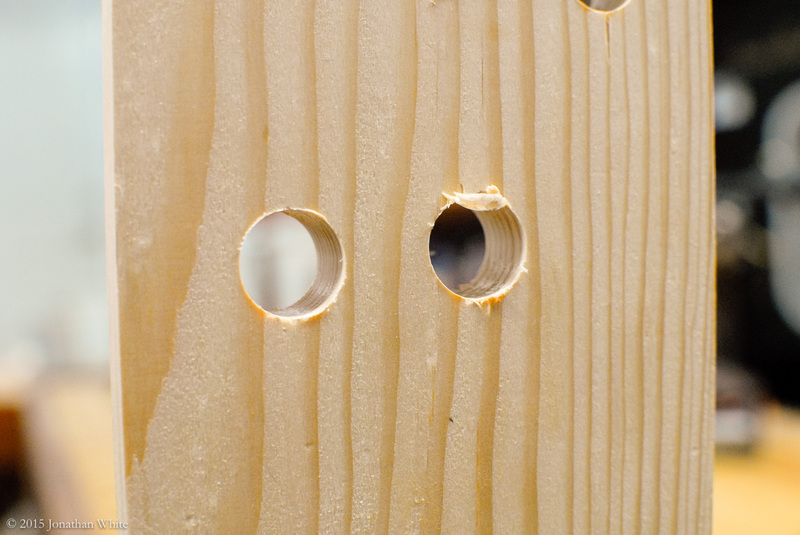 I’m drilling these holes using my 18v Rigid cordless drill which is a fairly powerful and solid tool. 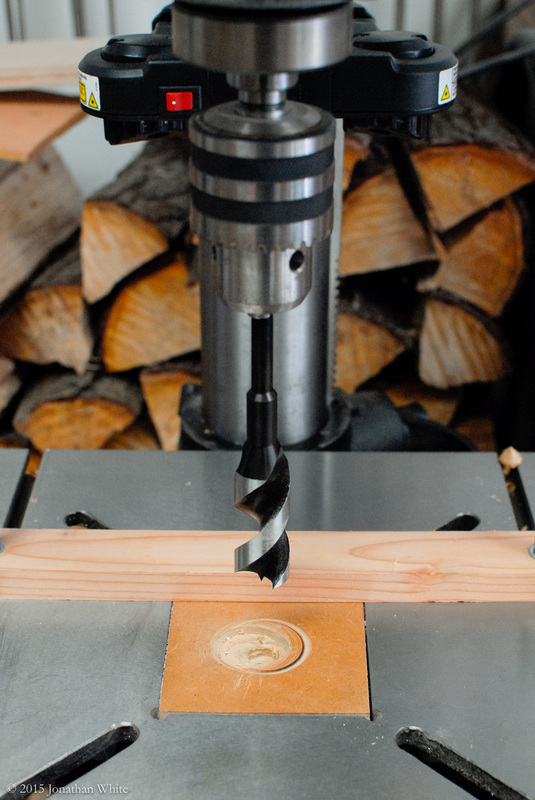 Drilling a test hole in Red Oak with the Ultra Smooth Auger. I did not stop the drill when the lead screw poked through the other side and finish from the back. Instead I drilled all the way through and did not use any support piece as a backer. This should simulate worst case scenario for blow-out on the back. Surprisingly, this yielded very little blow-out. In a real work-piece where I was very concerned about a clean exit, I would stop the auger and finish from the other side. A very little bit of blow-out on the exit. Next, I mounted the OverDrive bit in my drill. I repeated the hole, this time with the OverDrive bit (hole on the left). The OverDrive bit also had a very clean entry. Ok, here’s where I was really surprised. So much for my initial theory, the OverDrive bit was noticeably cleaner. Wow. The exit hole (the one on the right) really surprised me. Zero blow-out! None! Thinking that maybe my ¾” auger bit wasn’t as sharp as brand new, I decided to repeat the test using my 5/8″ bit, which has seen almost no use. Since there is a corresponding sized bit in the OverDrive set, this was simple to do. 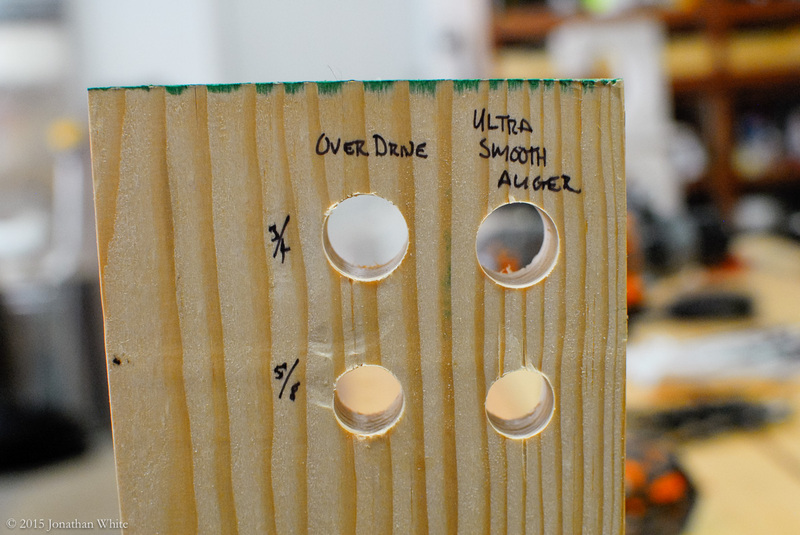 I repeated the test holes with the 5/8″ Ultra Smooth Auger. The 5/8″ Auger bit had a nice entry. I got a little bit of blow out with this one. I removed the cling-on and was left with this. Next, I tried the 5/8″ OverDrive bit. All of the entry holes were very clean with no significant differences between them. Again, a very clean entry. I did get a little bit of fine blow-out with the 5/8″ OverDrive, but it too was less than the corresponding sized Ultra Smooth auger. A very small amount of blow-out on this one. 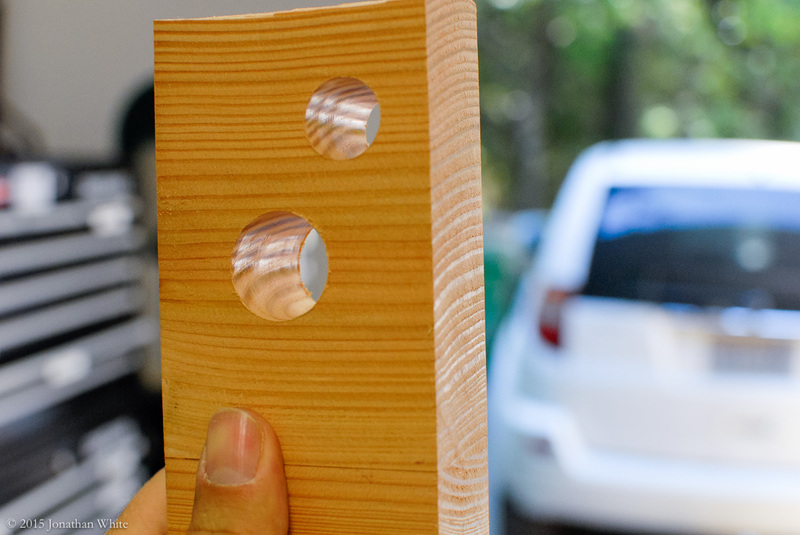 I then found a scrap board of Douglas Fir that was left over from my workbench build. I thought this would be a good species to use for two reasons. One, I use it a lot. 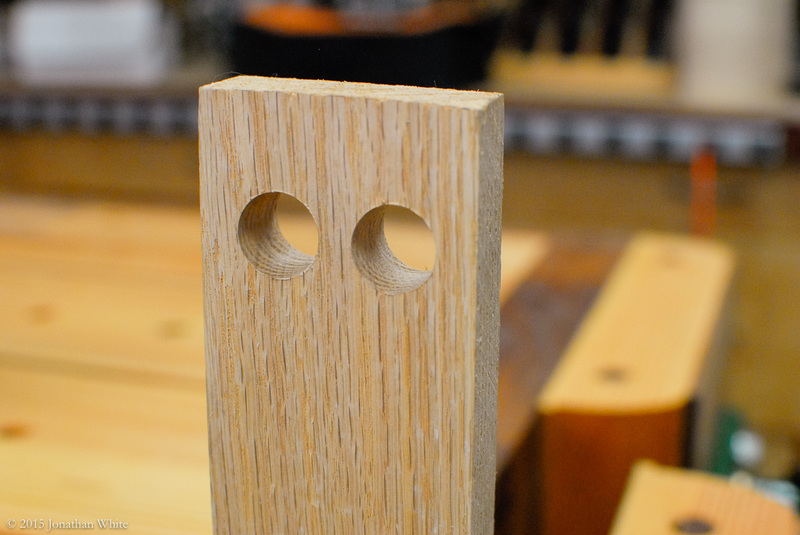 And two, it has very distinct hard/soft early-wood/late-wood growth rings that are notorious for chewing up chisels. This alternating hardwood/softwood can make it easy for blow out as the wood has a tendency to split in between these growth rings. I repeated this whole process in Douglas Fir. Again, exit holes were better with the OverDrive bits. At this point, I thought I should also include a hole bored by a brace and bit. This is how I would usually make this hole, especially if I was currently on a hand tool kick. A number 12 Irwin bit should be ¾”, so that is what I selected from my set. A #12 Irwin Bit and a Yankee 2101A Brace. The Irwin bit made a nice clean entry. I intended to stop boring just as the tip of the lead screw poked through the back side. I took a turn to many and messed things up a little. The Irwin bit had a perfectly acceptable entry. The mess on the backside of this hole, is because of my faulty technique and not because of any inherent inaccuracy in the tool. The blow-out on the back was my fault, not the tools. 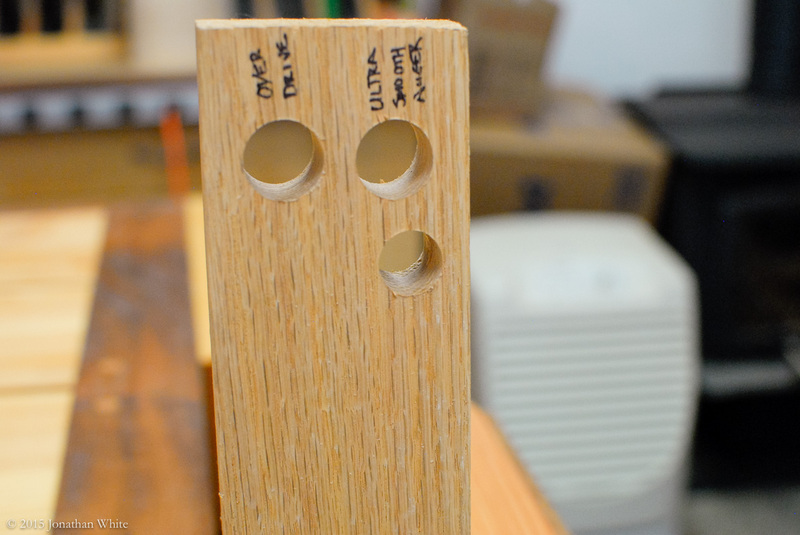 I also tried boring the same hole in Red Oak. I was a little more careful this time and completed the hole by putting the lead screw back in the small exit hole and boring in from the back. This is the proper way to use this tool when clean entry and exit holes are needed or it will show in the final project. The results were great. 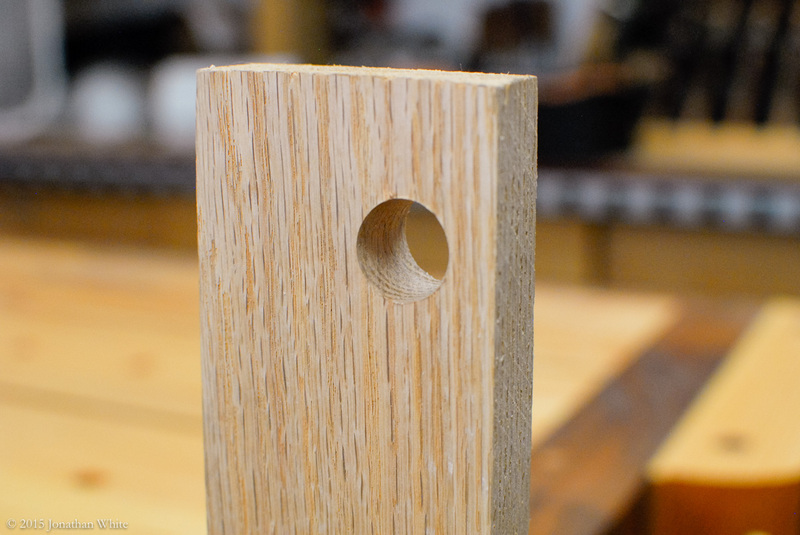 ¾” hole drilled in Red Oak with the brace and bit. 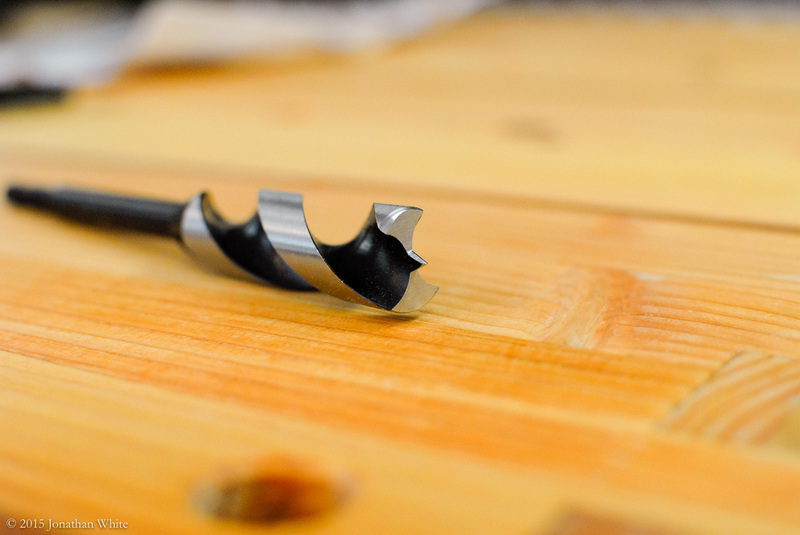 One thing that caught my eye about the OverDrive bits was that they feature a ¼” hex shank. 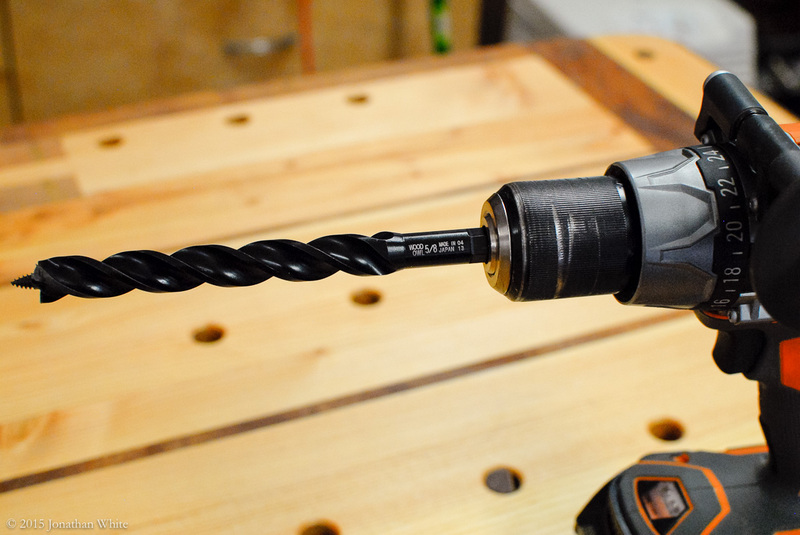 If you look far above you can see that the Ultra Smooth Augers have a much larger shank and will not fit in anything but a full-sized drill. It occurred to me that one advantage to the OverDrive bits would be that I could use them in my smaller 12v tools. 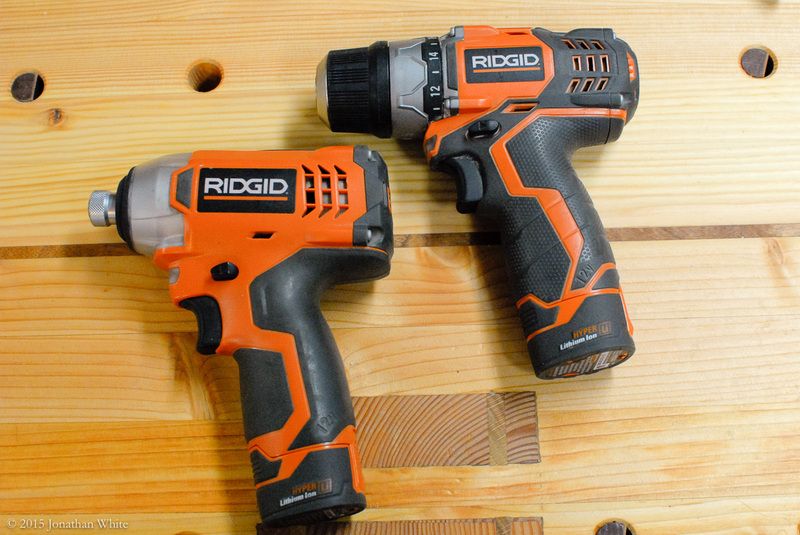 I really like the smaller rigid drill and impact driver. I find that I use them 5 times as often as the larger 18v drill. 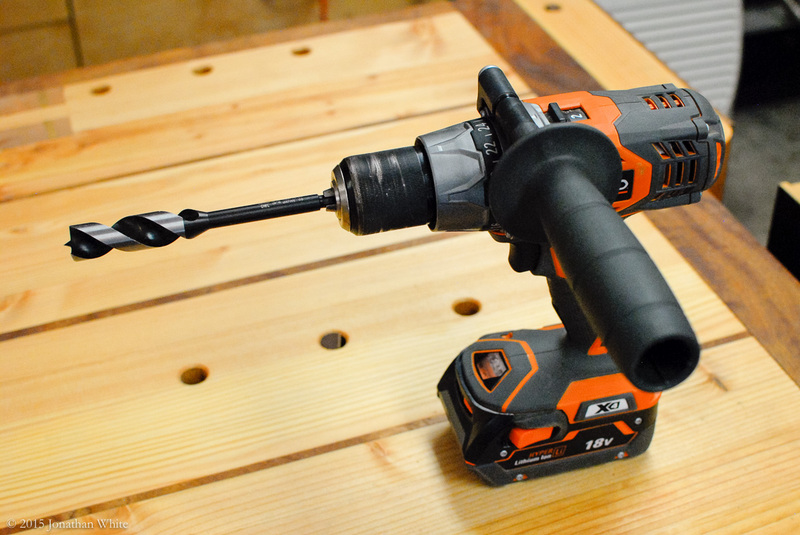 Only when doing something much more heavy duty, or when I want to take advantage of the add-on handle and use both hands, do I reach for the larger drill. I thought it would be a good idea to try out the OverDrive bits in these smaller tools. I also tested the OverDrive bits in my smaller drill and impact driver. A ¾” OverDrive bit in my Rigid 12v drill. A ¾” OverDrive bit in my Rigid 12V Impact Driver. The smaller drill handled the bit well. 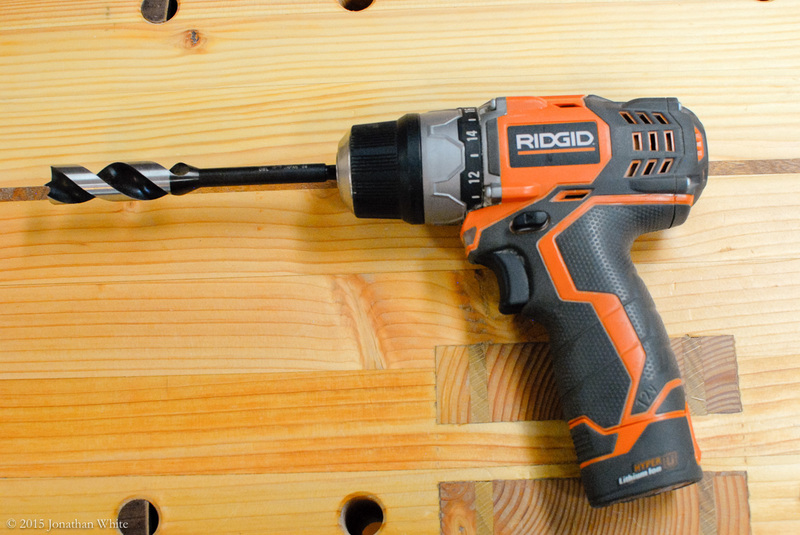 I think handle on the larger drill helps improve accuracy, but the smaller drill had plenty of power to handle this ¾” bit. Both entry and exit holes were nice. The drill worked well, but I preferred using the larger 18v drill for a bit this size. However, things changed when I attempted to use the impact driver. The hex shank on the OverDrive bits has a ball detent and I supposed that this was to enable it to be used in an impact driver. I do not recommend that the OverDrive bits be used in an impact driver. 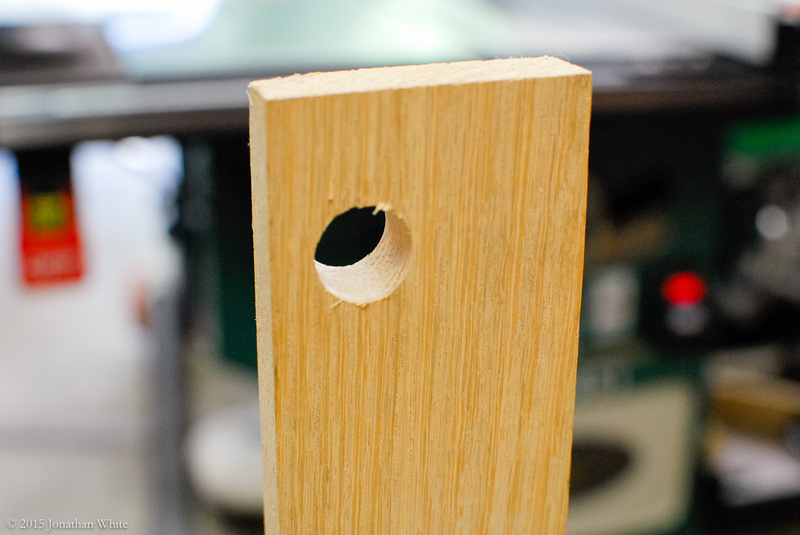 The hole was no way near as smooth and it got pretty chewed up with the ratcheting action of the impact tool. 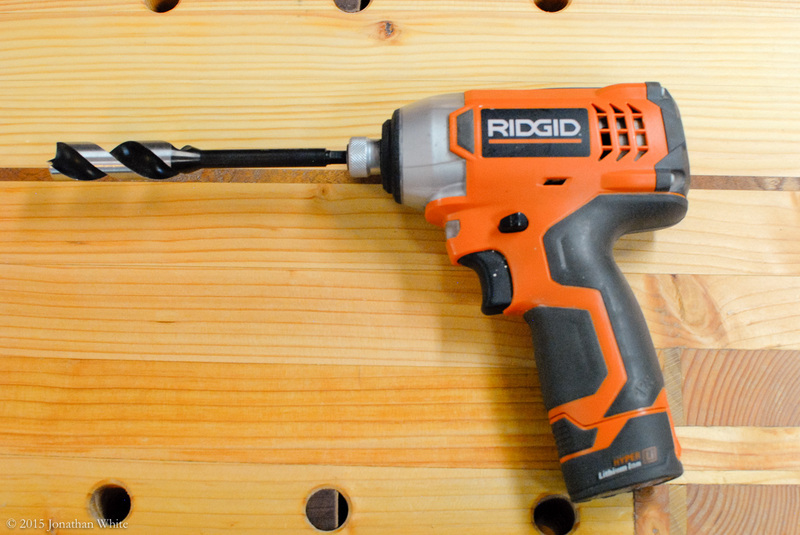 If you are drilling holes in wall studs for running wiring and the hole is never going to be seen, then go for it. 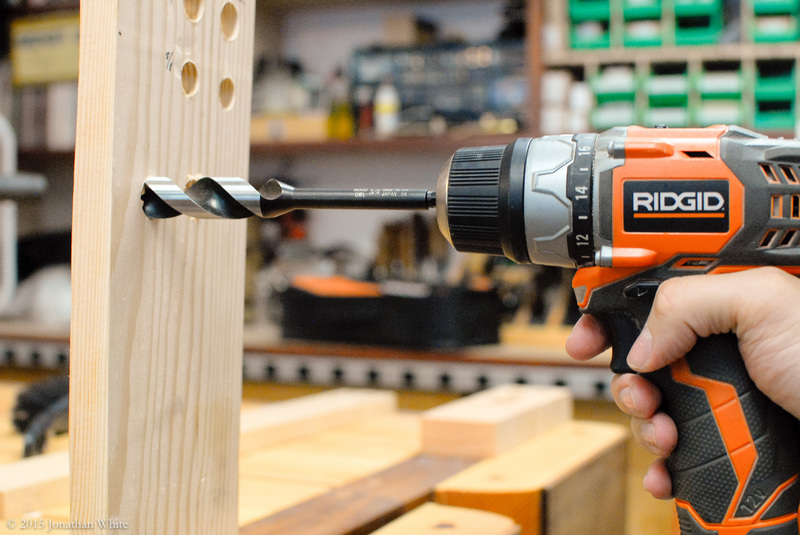 If you’re drilling holes in a piece that will show, use a drill not an impact driver. The impact driver was not a good choice for this bit. The hole was quite chewed up. 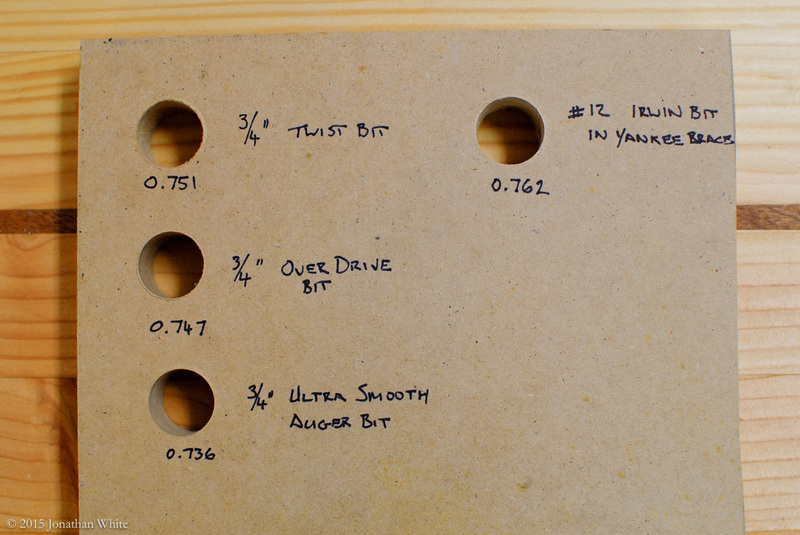 With the bits tested in three different cordless tools, I thought I would take the bits for a spin in my drill press. 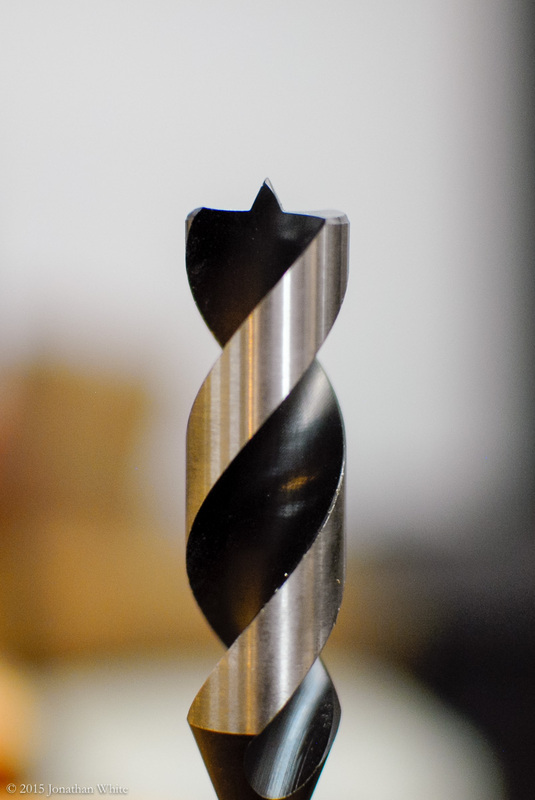 I think that the ability to do this is one of the major benefits of these drill bits. 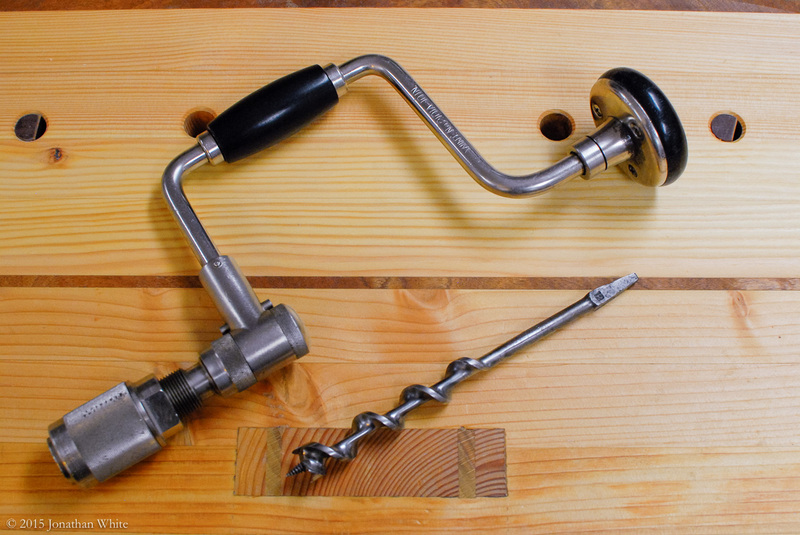 With most augers, the bit has a lead screw which prevents you from being able to use it in a drill press. The OverDrive bits however, have only a spur point. 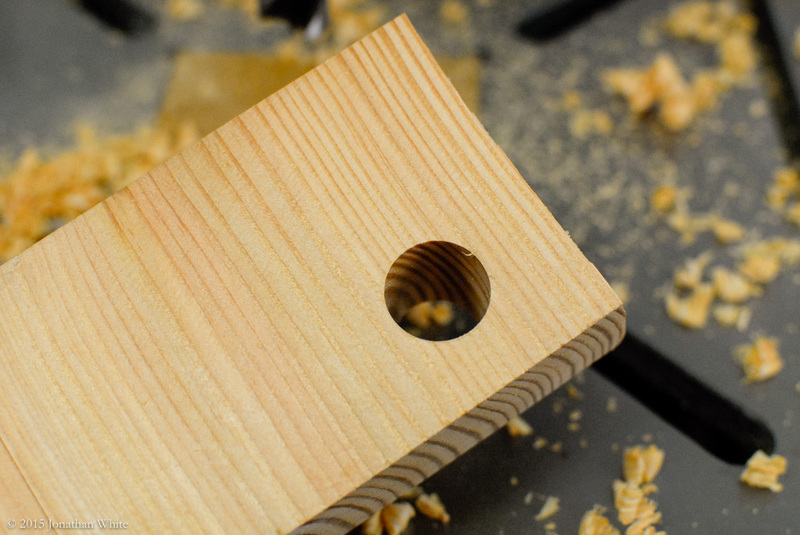 I like the spur points, because like brad points, you can accurately locate the hole without the tip of the bit wandering around on the work-piece. I mounted the ¾” bit and got out a scrap of Douglas Fir. 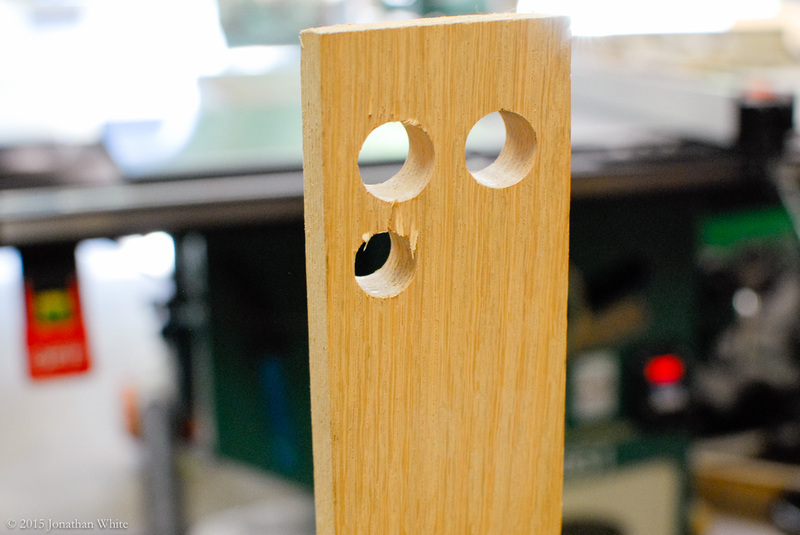 This was an off-cut from the sliding deadman that I made for my workbench. 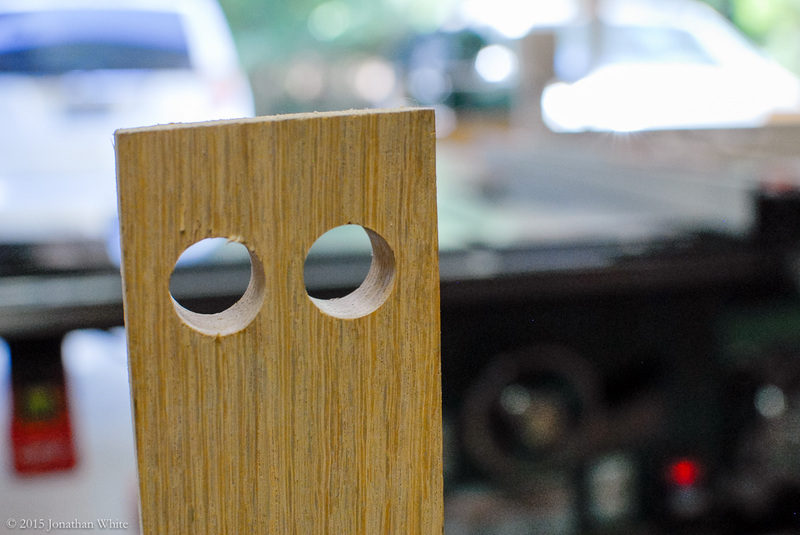 Next, I Installed the ¾” bit in the drill press. This drilled an incredibly clean hole. Wow, I couldn’t believe how cleanly this bit cut. 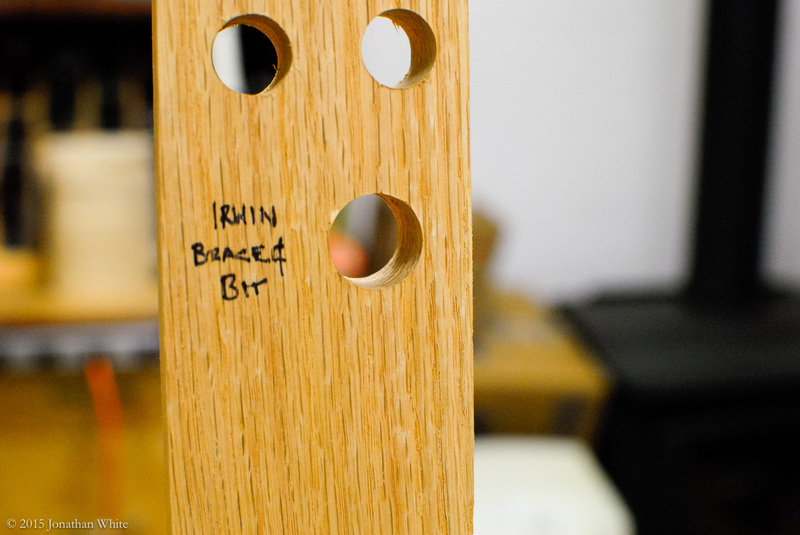 The drill press is where these bits really excel. The interior of the hole looked polished. Okay… I realize this is getting a little out there. 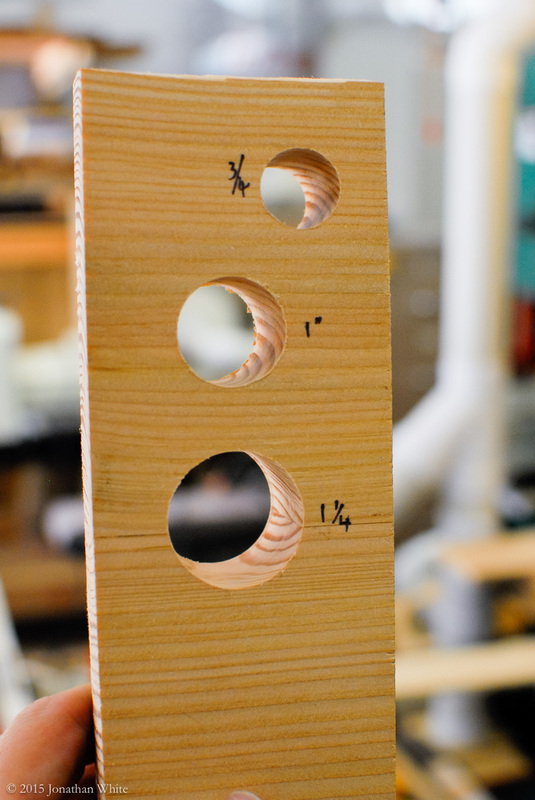 You’re asking how often do I need to drill a hole that looks good on the inside? I get it. 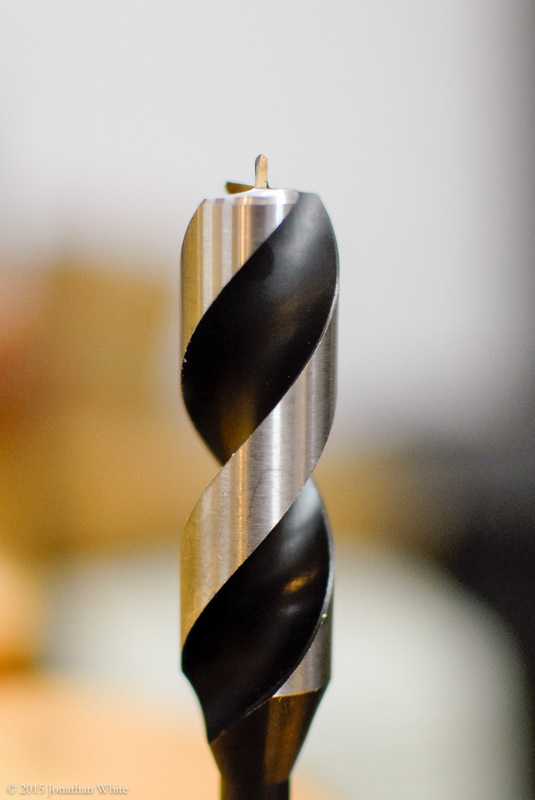 I’m not saying that this is a really important feature to have in a drill bit, but it was impressive to see. The wall of the hole was so smooth that it actually had shine to it. I thought I would try some of the larger bits. I thought I would try out the 1″ bit. Like the first, this hole was also very clean. The 1¼” bit also yielded fantastic results. The drill press is where the OverDrive bits really excel. 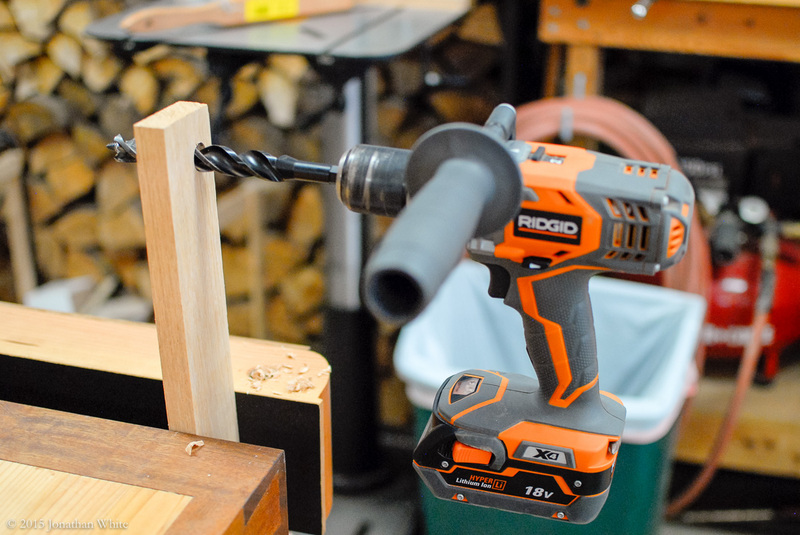 I realize that the manufacturer says that the bits were designed for cordless drills, but I think they are missing their potential as they worked like a dream at the drill press. I really enjoyed using these bits at the drill press and am far more likely to use these in the future than forstner bits, at least in the six sizes that are in this set. 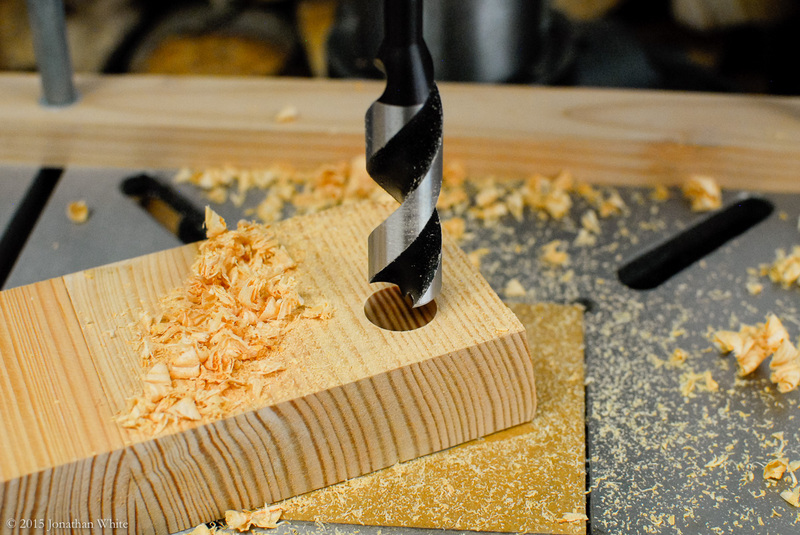 At this point I got a crazy notion to put a ¾” Milwaukee twist bit in the drill press and try it out. 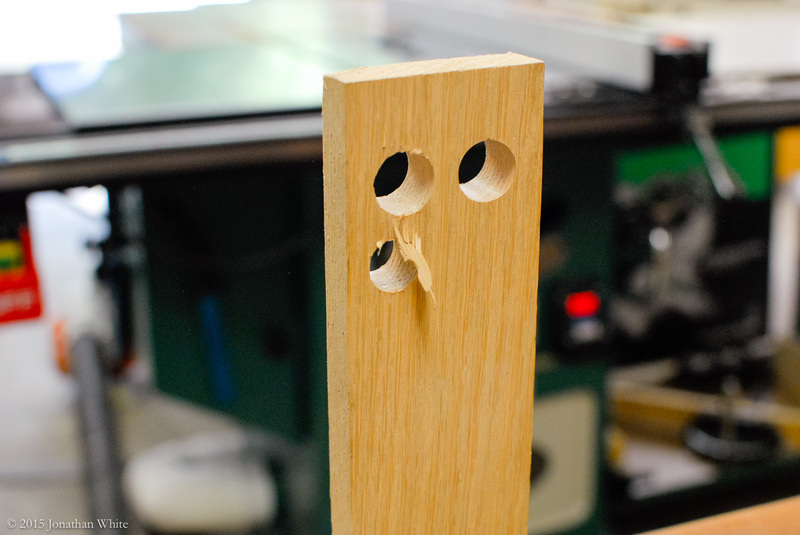 I had to use considerably more force on the drill press handle to get the bit to cut and the results were not great, as you can see below. 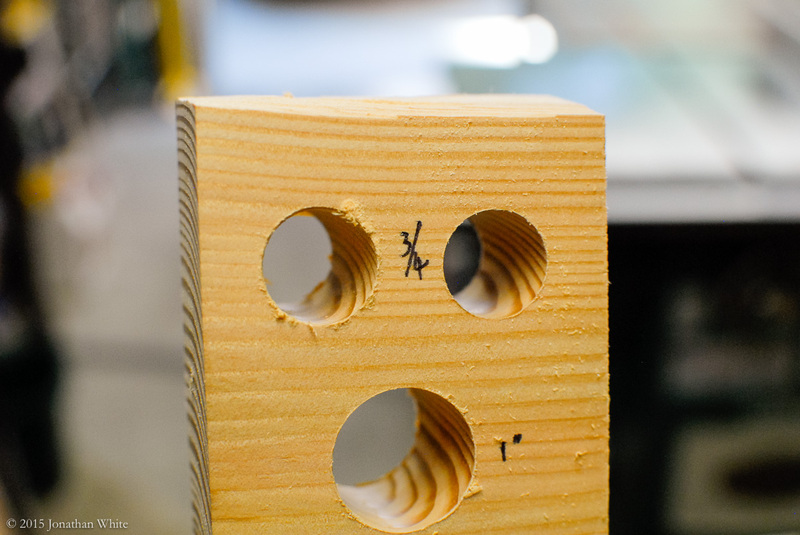 The top left hole was done with the twist bit at the drill press. The exit hole (now on the right) was not as clean as the OverDrive bit. I had a problem with my earlier WoodOwl product, the Ultra Smooth Auger. It was listed as ¾”, but the hole that it bored was not that size. 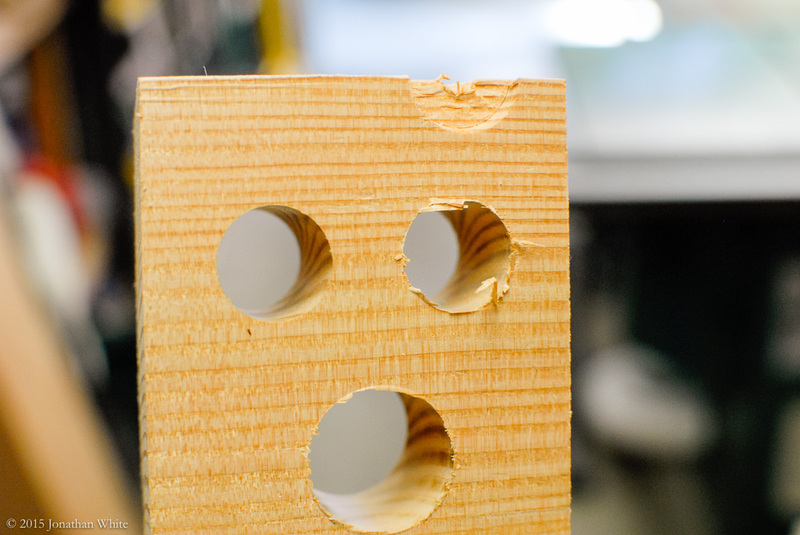 This caused me some problems when I discovered that the Veritas Hold Downs that I purchased for my workbench would not fit all of my newly drilled dog holes. 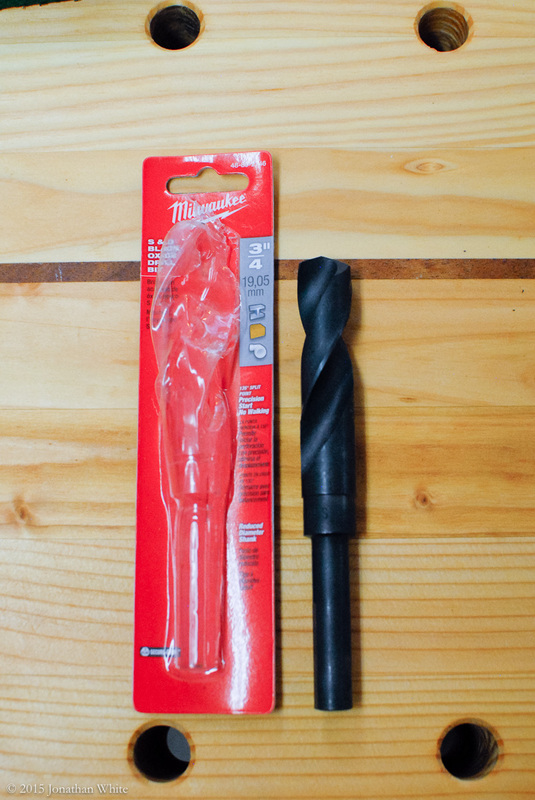 I had to go out and buy a Milwaukee twist bit and very, very slightly bore out each hole. This was a pain. It was also a waste of $20 that I had to spend at Home Depot for the bit. I wanted to see how a ¾” twist bit compared. To test the size of the bits, I used some scrap MDF. This is very stable and cuts easily. 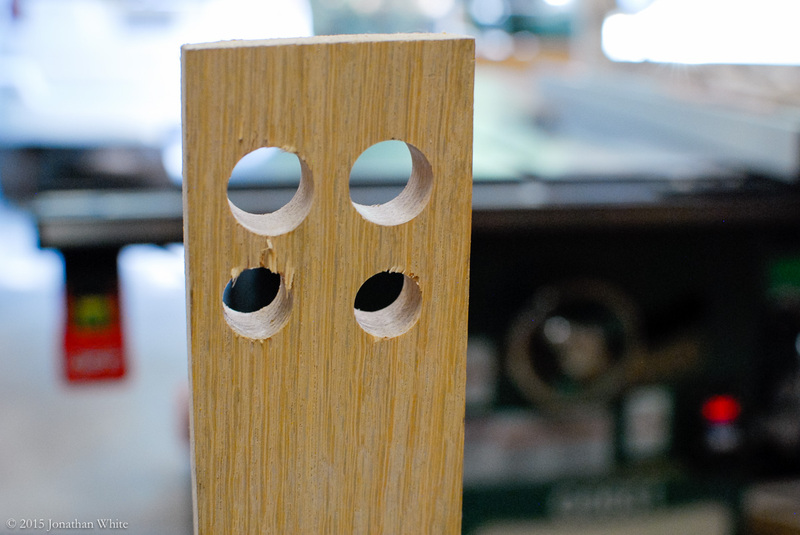 I drilled nominal ¾” holes at the drill press with the Milwaukee twist bit and the OverDrive bit. I drilled he Ultra smooth auger hole using the large 18v drill (since it has a lead screw, I couldn’t put it in the drill press). The Irwin bit was mounted in my Yankee brace. I then got out my calipers and measured the actual holes made by each bit. Measuring the hole size with calipers. All four holes were nominally ¾”. Actual sizes varied. The Milwaukee twist bit was the most accurate (.750 would have been exact). The OverDrive bit was very close, it was only under-sized by 0.003″. The #12 Irwin bit surprised me, as it bored a hole considerably larger than ¾”. It was 0.762″ or 0.012″ over-sized. The Ultra Smooth Auger has me thinking that I got a defective bit. It measured 0.736″ which is 0.014″ smaller than it should be. This is a considerable error and has to be outside of any acceptable tolerances. 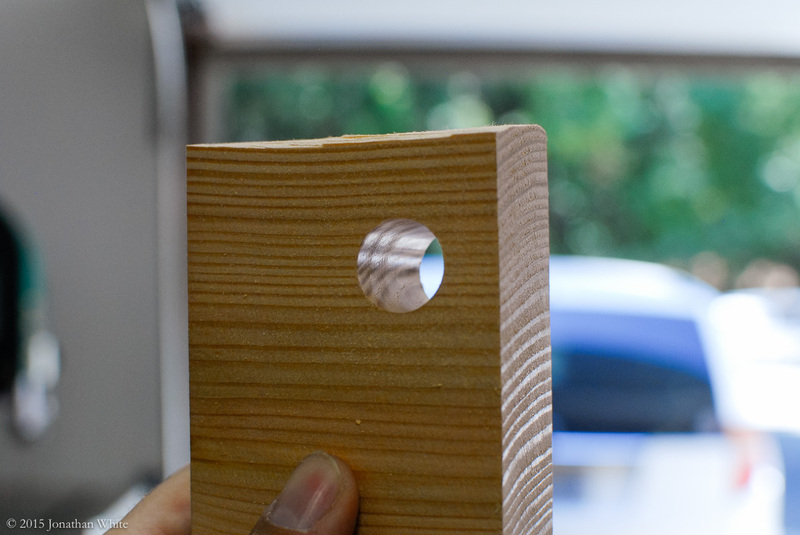 So… The twist bit was the most accurately sized hole, but I can’t say that I would use it. 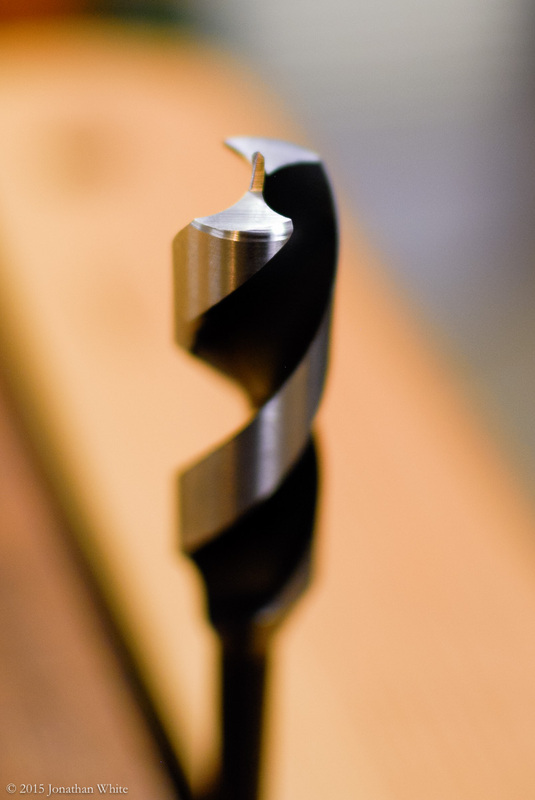 It is difficult to accurately locate a large twist bit hole as the tip of the bit tends to want to wander as you start drilling. The only place I would ever attempt to use this bit is at the drill press with a clamped work piece. And, as you can see above, when I tried this the results weren’t pretty. 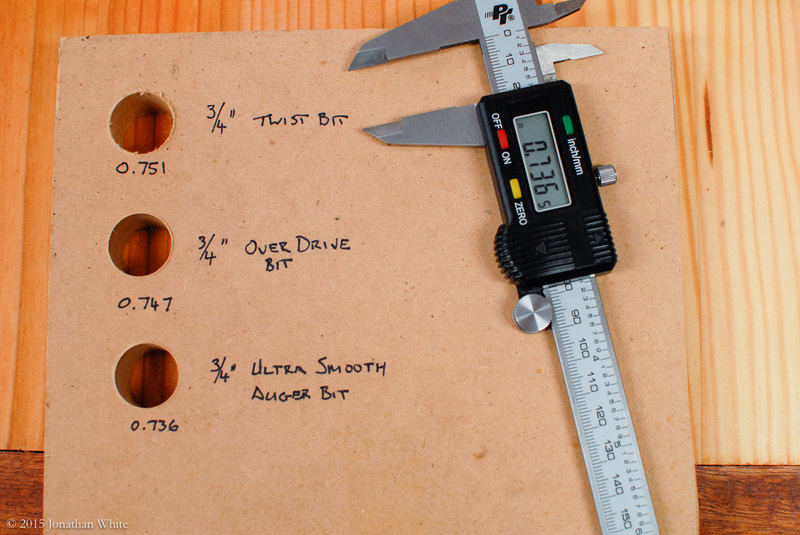 The OverDrive bit was very slightly off the stated size, but 0.003″ is a small error in woodworking. 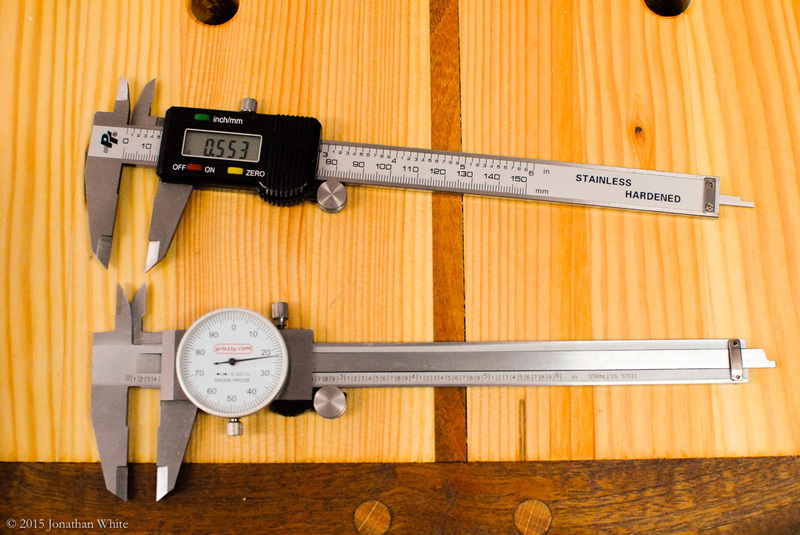 Woodworkers are often faulted for thinking in machinist terms where 0.001″ can be significant. A 0.003″ error in wood is really not unacceptable. 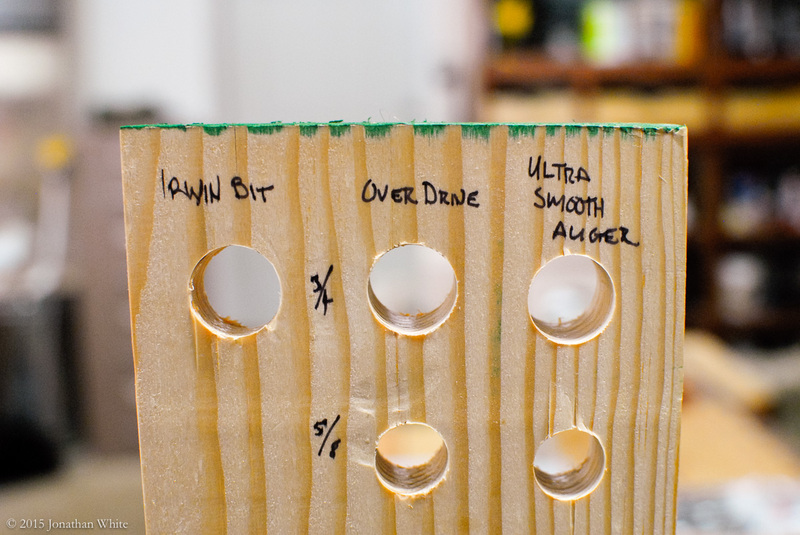 I think that while the Milwaukee twist bit was more accurate in size, the fact that the OverDrive bit has a center spur would result in greater overall accuracy in hole placement. 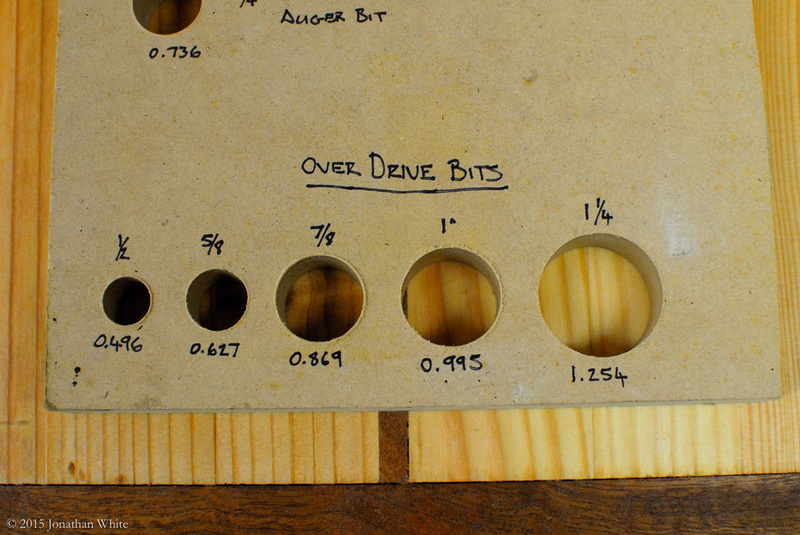 The OverDrive bit is the one that I would use of the four bits tested. But wait you say, “You have only tested one of the six bits in the set”, and right you would be. 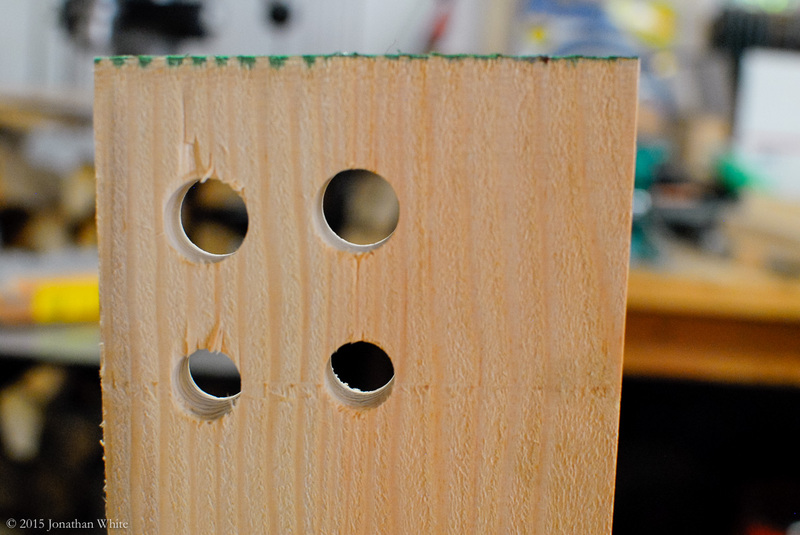 I then drilled holes in the same piece of MDF using each of the five remaining bits in the set. The nominal and actual sizes of the tested bits. Not one of the holes was dead-on its stated size, but all were close. I was concerned that perhaps my calipers were off, so I rechecked my measurements using a manual dial indicator caliper. The dial caliper measurements were all within one or two thousandths inch of the digital caliper, so I was satisfied that there was no error there. I double checked my measurements to make sure that my digital caliper was not faulty. Ultimately, you have to ask yourself if this is within acceptable range for you. I think you have to keep in mind that these are woodworking bits If I were drilling holes in steel, I would want the stated size to be exactly what I get. 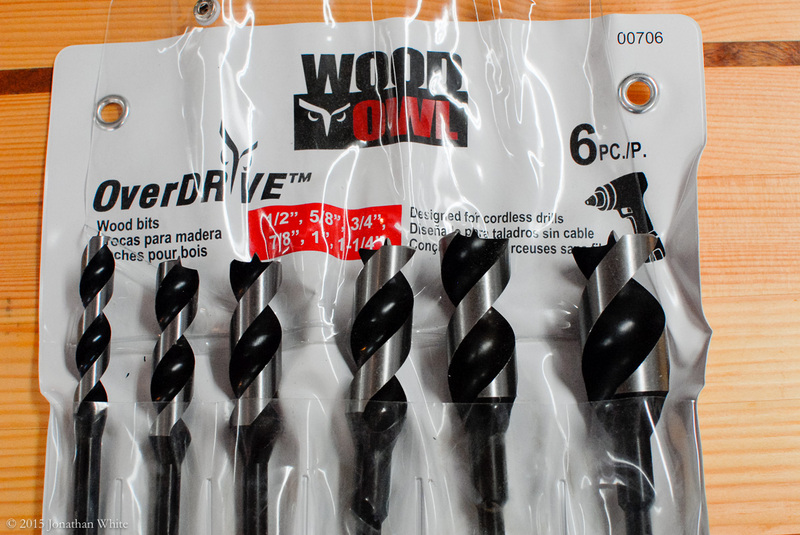 For my uses, I think that these OverDrive bits are within an acceptable range for woodworking. I would have loved to see them all be within 0.002″, but perhaps that’s wishful thinking? I looked and found these drill bits for sale on Amazon for $66.99. I also found them on Atlas Machinery for $68.83 (Canadian) for those living north of the border. I also looked for similar sets from other manufacturers. I found an identically sized set of bits made by Irwin for about $28 also on Amazon. The Irwin set also includes a case, but aren’t really an apples to apples comparison, as they have a lead screw. I haven’t tested these, but they look to me as though they are intended for rougher work. For comparisons sake, you could buy a 6-piece set of similar sized spade drill bits for about $25. I really don’t like using spade bits for anything but rough holes in wall studs. I would never use them in furniture work. 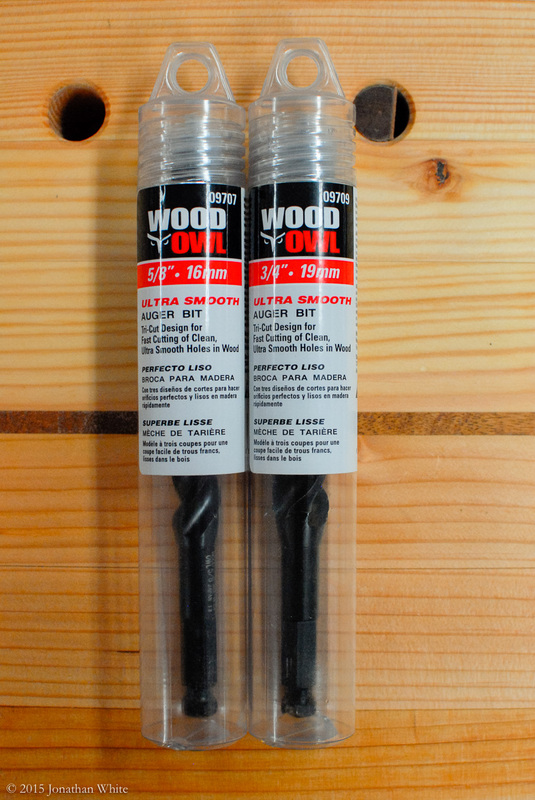 Going to the other end of the spectrum, buying six WoodOwl Ultra Smooth Augers in these six sizes would cost $115.70 if ordered from Traditional Woodworker. This would nearly double the cost of the bits, and as my above tests show, don’t yield any better a result than the OverDrive bits. $66 is not super expensive, but if I were in the store and looking at a $28 Irwin set and a $66 WoodOwl set, I might have bought the cheaper set. I’m glad that I was not in that situation, as I would have missed out on what turned out to be a fantastic set of WoodOwl bits. I think that they are worth the $66 asking price. I was surprised by these bits. They cut more cleanly than the Ultra Smooth Auger bits and I was certainly not expecting that result. I love the fact that they don’t have a lead screw and that you can use them in a drill press. 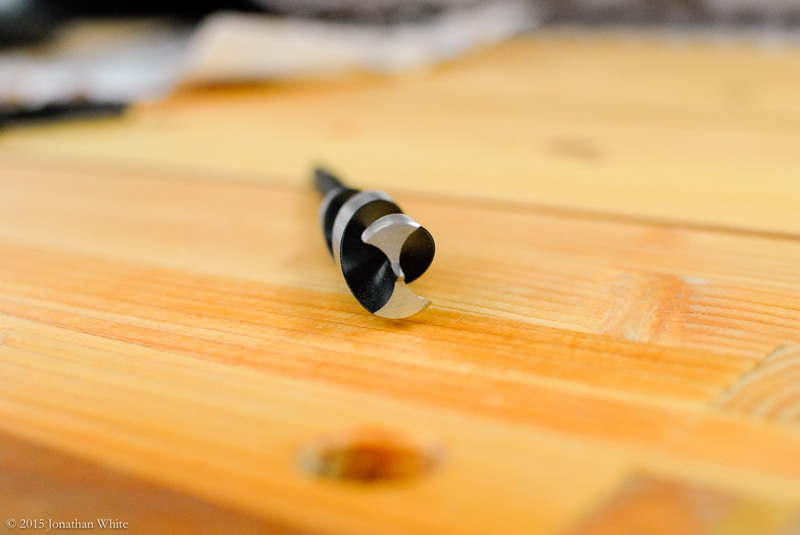 I also really like that the 1/4″ hex shanks fit in my smaller drills. Any forstner bits that I have in these sizes just became obsolete. I like using these at the drill press far more than using a forstner bit. Unless there is a need for a hole with a dead flat bottom, I’ll be using these. I do wish that these bits were a little more accurate on their sizes. Also, I would like to see them packaged a little better. A $66 set really should have a case of some sort (preferably a hard case) to protect the cutting edges. The plastic pouch that they come in, doesn’t quite do it for me. Other than that, I think that they are a solid tool. I hope that you have enjoyed my first tool review. I sure had a fun time doing the tests and writing it. I’m not sure. I guess it would really depend upon the chuck on your hand brace. Most vintage braces use a chuck designed to hold a square tapered pyramidal auger bit. This may or may not hold the hex shank of these bits. Other braces, like the three jaw one from Lee Valley, would very likely work. Hope this helps. Thanks for this terrific comparison. I’m currently struggling with figuring out what’s wrong with my Wood Owl Ultra bits. I was disappointed to find that the 7/16th size chuck wouldn’t fit in my hand brace. Do they happen to fit in your North Bros.? If that’s the case, I’ll get a new brace. I know thing would work best if I used them in a power drill but I do like having the hand brace option. Besides, it appears Mr. Schwarz does use them in a brace. One other tidbit. I found after drilling just a couple holes, the black coating was wearing off the Ultra bits. Did you have this happen to you? Sorry for the delayed response, I was on vacation. I’m glad you liked the post. I just went out to the shop and can confirm that the WoodOwl Ultra Smooth bits fit nicely in my North Brothers Yankee brace. I also looked at the black coating on my ¾” bit. The coating has started to wear off in the high friction areas, i.e. right behind the cutting edge and the edges or lands of the bit. 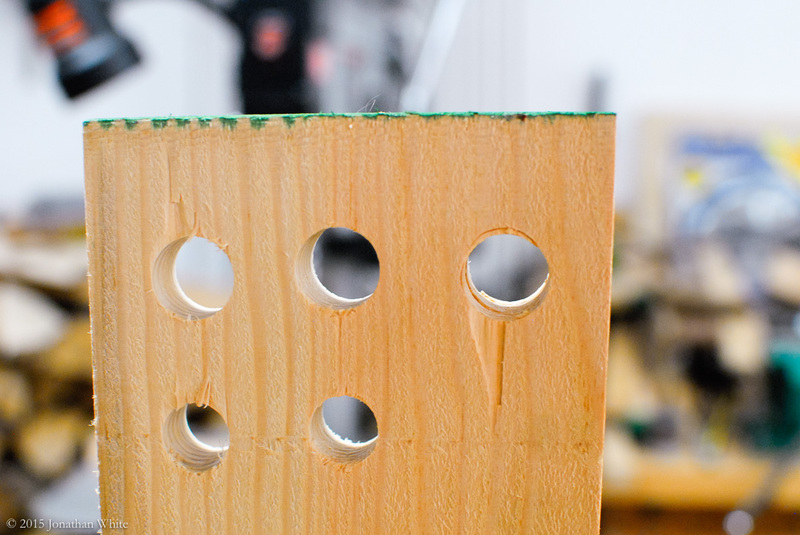 That said, the bit has drilled hundreds of holes. I keep the bits in the plastic tube they came in, and wipe them down with oil when I put them away. Dude, just found your blog and your killing it. Great writing, photos, and testing methodology. You’ve got a new regular reader. Keep up the great work!!! Thanks Damien. I appreciate it.